I'm honored to be included here! Here are "A few of my favorite things". Hello I'm Mati Rose McDonough and I’m visiting while Holly is moving as part of her August guest series “A few of my favorite things”. I’m a painter in San Francisco and have a blog, website of my art and etsy shop. This photo is in my bedroom where I have one wall painted turquoise (the others are white and the ceiling is sky blue). 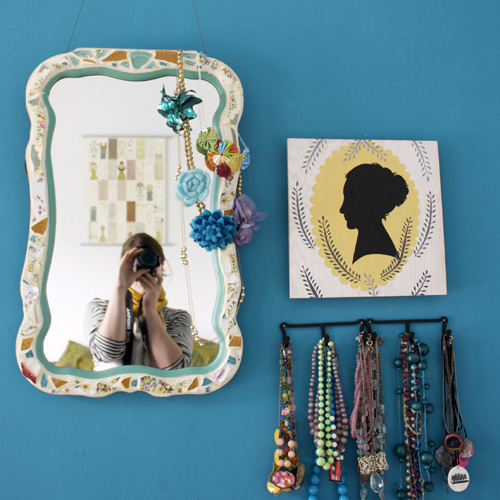 One of my favorite things is this ceramic mirror my mom made from pieces of broken china she found in Maine where she lives. I love it because It is a daily reminder of my mom and makes me feel nostalgic for the past when people used fine china. I also clearly like accessories—plastic gumball necklaces mixed with handmade and vintage pieces. The silhouette painting is by my local SF pal Annie Galvin. 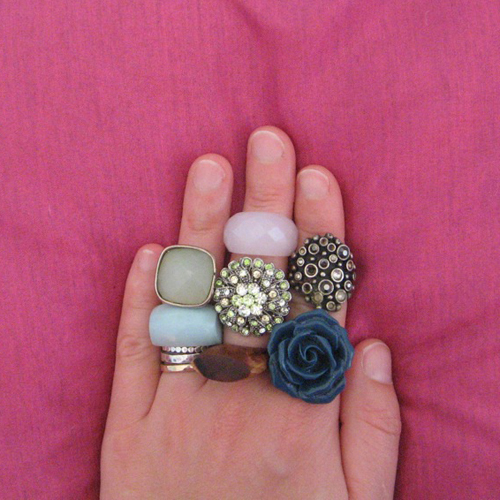 This photo is an ode to my love of chunky cocktail like rings. They make me feel fancy, even though they were mostly inexpensive baubles. 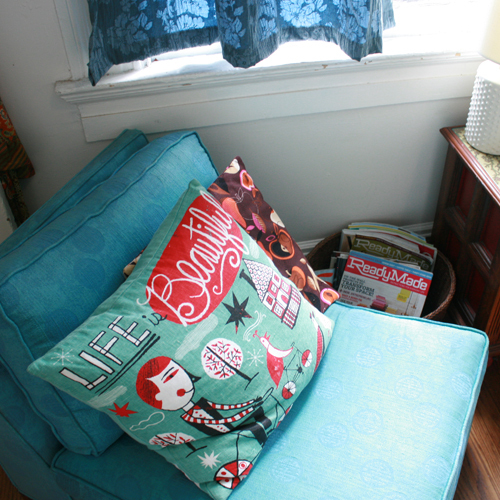 Moving along, I love this 1960’s turquoise chair that serves as the reading nook in my bedroom. It makes me feel like lounging and reminds me to slow down, sip some tea or a lemon drop and look through some magazines for inspiration. The top pillow is by one of my favorite illustrators Nate Williams. Next, these tiny bright espresso cups are hung over my kitchen sink and are mostly from the dollar store, but they make me so happy every time I stand here to do the dishes. 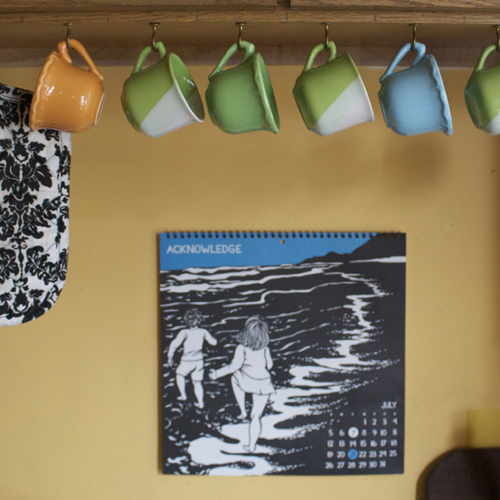 The calendar is by Nikki McClure. I admire her graphic simplicity using cut paper and grounding sentiments. 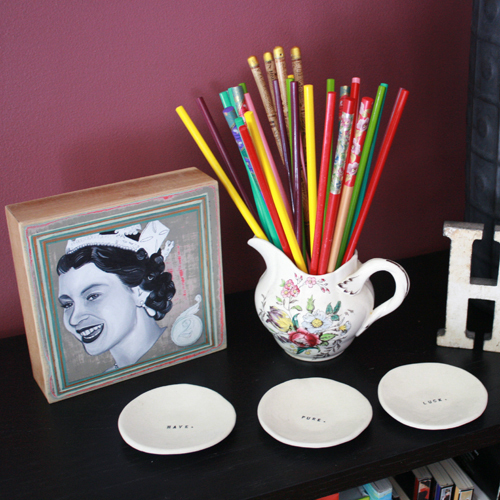 Lastly one of my favorite groupings combines my grandmother’s china pitcher filled with colorful chopsticks from Chinatown and tiny plates my friend Stefanie gifted to us for our wedding from local ceramicist Rae Dunn that say: "Have. Pure. Luck." The Queen Elizabeth painting is by my friend and rising art star Christina Empedocles. The combination of these few beloved things on my shelf makes me feel connected to strong elegant women in the past and present. In looking through a few of my favorite things I realize that I like playful, affordable, bright and bold mixed with more feminine pieces. My artist husband Lovejoy's tea room. I appreciate sassy, beautiful, unique and quirky characteristics combined. Some of my favorite movies and muses are Jean Seberg in Breathless, Margot Tenenbaum in The Royal Tenenbaums and Parker Posy in Party Girl. Not to mention singers Santigold, Lucinda Williams and Cat Power and writers Isabel Allende, David Sedaris and Persepolis author and illustrator Marjane Satrapi. I love painters Squeak Carnwath, Beatriz Milhazes and Margaret Killgallen. Favorite advice: Be yourself everyone else is taken. Thanks for spending a little of your time with me today on decor8 -- I hope you've enjoyed seeing a few of my favorite things!- Mati.